Hi everyone I'm Jack Red, today I continue my celebration of the upcoming 25th anniversary of Sonic series. I figured because in the last part I reviewed so many Sonic games. It would be nice to go in an different direction. So why talk about Sonic cartoons right? Not counting the ova series aka first movie. There are five cartoons based on Sonic the Hedgehog franchise. Starting as early as 1993 to more recently 2014. All five of them present very different takes on Sonic. Each brings something new to the table. I could do five long detailed reviews on all of them. But that isn't the point of this blog. Of course not the point is which should be the definitive Sonic cartoon. So I will try my best to say most of what needs to be said. In the end this is my opinion alone not inspired or based on opinions of others. Just like Part 1, I'm starting from the worst. In this case I would rather play Sonic 4 Episode Metal than watch an episode of this. I am not kidding nothing really screams Sonic in any possible way. Sonic takes on Dr. Robotnik with an brother & sister on an quest that's confusing. Why because on one end it's clear they must Dr. Robotnik for good. But on the other they're constantly searching for their mom for answers. Which seems to not be done well affecting the overall theme. Sonic doesn't act like him as you expect him. Of course we can't ignore this is partly an musical show. I can understand three different people voicing each hedgehog. What I don't understand is why one guy voices all three as their regular voices. Dr. Robotnik was also horribly portrayed that easily could be it's own blog. Easily the most mixed Sonic show for many reasons. The original Japanese version is an great show. Sadly when brought to the United States. 4Kids ruined it's dub so hilariously bad. The only good thing was Dr. Robotnik's voice actor. Hands down this was the closest adaptation to the games. All the characters, chaos emeralds, rings, stories, everything nailed very well. I wasn't an big fan of most new characters. Basically we have an great anime horribly altered & dubbed. I will give them credit for recreating Sonic Adventure 1 & 2.3. Adventures of Sonic the Hedgehog (1993-1995) 1 SeasonThe original Sonic cartoon that almost didn't happen. Around this time we been getting great Sonic games. This brought a lot of things from the games which was surprising at the time. Maybe not perfect but Sonic, Tails & Dr. Robotnik are still done well. This was meant to be an slap stick comedy show. Most don't get it's jokes or wacky animation choices personally I love it. This show does embodies which Sonic's rivalry with Dr. Robotnik is so legendary. Interesting enough some facts originally in this show became actual character traits. For example Tails' fear of thunder & Sonic liking Chili Dogs. Also for being the first Sonic cartoon. I was amazed how good it actually was. Yes like Sonic X, Adventures of Sonic the Hedgehog are also mixed. But thanks to being an huge part of memes. People constantly come up with mess up jokes in both pictures & videos. Another reason to love this show. The more recent Sonic cartoon is done in CGI that meant to be it's own franchise. Yes I might not be able to judge it to most of the series because of that. Yet it still does pull things from those games. Each episode may be short but well thought out. Each Sonic character is done very well especially Dr. Robotnik. Sonic with his friends takes on Dr. Robotnik very often as it should be. I actually really enjoy watching this show. However I have two major problems relating to it. So far up to Sonic Boom, games based on shows were great. The same can't be said for Sonic Boom with the Wii U game be really bad. My biggest problem is how different Knuckles between regular Sonic & Sonic Boom. I really hate Knuckles in Sonic Boom with an passion. If you're an Sonic fan then you should already what number 1 is. Hands down the definitive Sonic cartoon without an doubt has to be Sonic the Hedgehog aka Sonic SatAm. This was quickly made by another team within DIC Entertainment as an deal to allow the first two Sonic cartoons to air. 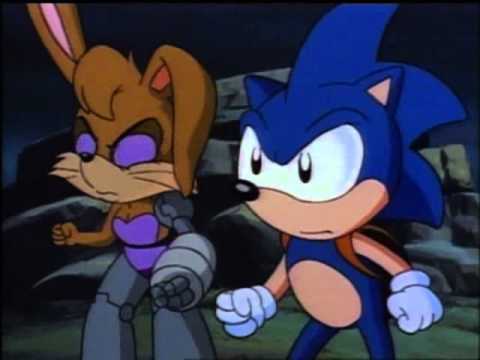 This meant Adventures of Sonic the Hedgehog got week days with Sonic SatAM got only Saturdays. It's true this doesn't pull much from the games. But damn everything else in this show is really good. Every episode is worth watching with such great stories. 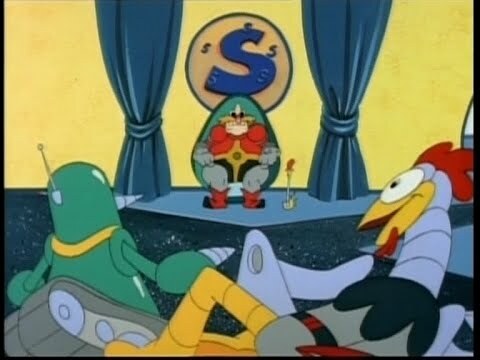 In my opinion this had the best Dr. Robotnik in any Sonic cartoon. Sonic is done a lot better from Adventures of Sonic the Hedgehog. In fact it's so good this actually inspired an long standing world record holding comic book series. The demand was very high for years until it got release in it's entirely on DVD. I only had one problem with this show keeping it from being flawless. In some Sonic cartoons, Tails would help out as Sonic's side kick & best friend. In this show, he was an little kid being protected by the rebels. Despite that issue, Sonic SatAM has such an great opening theme. I highly recommend it to every Sega fan. I hope everyone enjoys Part 2 of my celebration for the upcoming 25th Anniversary of Sonic the Hedgehog. Please keep on gaming, I shall be back soon with Part 3. I want to the spirit of Sonic the Hedgehog to be alive & well in all our hearts. So I'm Jack Red & I'll see all of you later.